Habitual use of ibuprofen and other common painkillers raises the risk of heart failure, according to a new study that's the biggest of its kind ever conducted. Researchers at the University of Milano-Bicocca in Italy found that many popular non-steroidal anti-inflammatory drugs (NSAIDS) double the risk of heart problems. 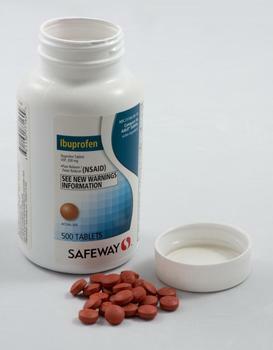 Taking ibuprofen, for example, raises the chance of being hospitalized by 18 percent for 14 days. The authors say the study illustrates the dangers posed by the easy availability of over-the-counter drugs. “This study offers further evidence that the most frequently used individual traditional painkillers are associated with an increased risk of hospital admission for heart failure. Moreover, the risk seems to vary between drugs and according to the dose,” said lead author Dr. Giovanni Corrao. The problem is not that NSAIDS cause heart damage but rather that they can unmask existing but undiagnosed heart failure, the researchers said. The findings are based on almost 10 million painkiller users from Britain, the Netherlands, Italy, and Germany. “The study reinforces the need to carefully weigh up the risks and benefits of using NSAIDs," said Helen Williams, consultant pharmacist for cardiovascular disease at the Royal Pharmaceutical Society. "Measures to help reduce risk include using medicines with a lower risk of cardiovascular problems, minimising the prescribed dose to the lowest dose that is effective and where possible, limiting the length of time the patient takes the medicine." “People regularly purchasing NSAIDs over the counter, such as ibuprofen, should seek advice from their pharmacist or doctor," she added.